2. the tail section is drilled, held together with cleco's and ready for the solid rivets. 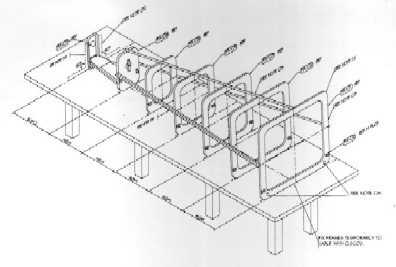 TIP: When constructing each section, use a complete frame so the measurements will be correct, the angles 90 degrees, and nothing moves when drilling the holes, and riveting the sections together. After my visit to the CLASS factory in Canada I have finally got back to working on the fuselage, and now that I have received instruction from Sean, Mario and Corrin on working with metal and particularly using a solid riveting tool, I am ready to go. Completed riveting the u shaped stringers on the top and both sides of the fuselage making sure everything remained square. 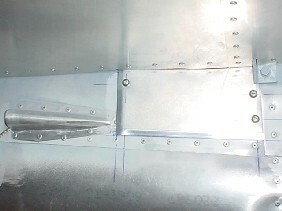 In particular, ensure the 1" X 1" X 1/8" notched angle that runs the entire length of the fuselage is centre. 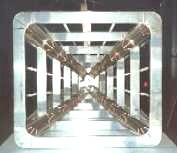 As the plans state, don't remove the clecos holding the frames in position, these are required to keep the whole section square. 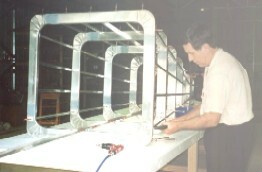 It is important to line up all the stringers so that the rivets will be in a perfect line when attaching the skins. TIP: Make a template for the position of the 5 rivet holes for the corner sections. Trim excess metal, deburr and prime before fastening each section starting from the back section 06 and work toward the front section 01. With all the internal corner sections riveted into position this will keep the whole frame rigid. Make sure the frame remains fastened to the bench to keep the measurements and angles correct. The stringers and exterior corners for the bottom section are fitted once the top and side skins and secure. 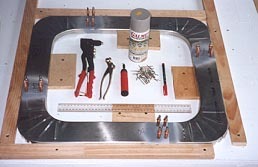 Make sure the external corners and the side two skins are not fixed into position until the control cables have been installed. The top and bottom skins have been riveted into position and thank goodness for the air riveter as this makes the task effortless and provides a better quality of finish as well. Before marking and cutting the bottom external corners at the rear of the fuselage, check with a string line or a long level to make sure the bottom is straight and flat. The overlap of the rear external corners with the bottom skin really does add strength and stiffness for the tail section. TIP: Cut a small piece of plastic tube and have it between the metal surface and the drill chuck as it will prevent the metal surface from being marked when drilling the holes for the rivets. Time to unclamp the fuselage from the workbench and complete the riveting of the sides, external corners and bend into shape the sections at the rear of the aircraft. Am I glad I have an air riveting gun as doing this task be hand would take so long even if it would build up the muscles in the right hand. TIP: Before doing so however pass the steel cable through the nylon guides from frame 1 thought to the tail section otherwise you won't get them through once the sides and external corners are riveted into position. Bending and shaping the metal skins from frame 6 to 7 then onto the flat edges of the vertical stabilizer is harder than I thought, especially trying to stop the metal from going out of shape and making sure the vertical stabilizer remain vertical over the centre line of the workbench. 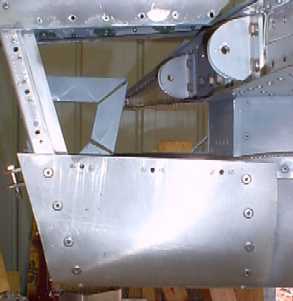 TIP: Secure the fuselage to the bench by bolting a heavy piece of time over the metal bracket (PA-15) to the bench to prevent movement, also leave the string line and plumb bob from frame 1 over the vertical stabilizer pointing to the centre of the line on the workbench. 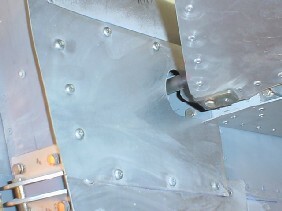 One task I had not done until now was to rivet into position the self-locating nuts for the two inspection plates where the horizontal stabiliser bolts onto the fuselage. A relatively easy task, but would have been easier if I had riveted the nuts into position before all the other parts had been riveted. The actual inspection plates I will cut from 0.025" plate after I have painted the elevators and connected the the control arm bracket.